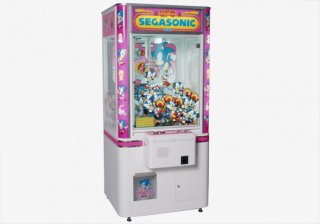 UFO Mini: SegaSonic is a Sega UFO Catcher - a claw crane machine which provides players with prizes should they manage to position the claw correctly to pick up the prizes which sit on the bottom of the machine. This machine only saw a Japan release and Sega provided most of the prizes through their Sega Prize company. This page was last edited on 10 October 2018, at 15:01.